For other uses, see Valle de Guadalupe (disambiguation). 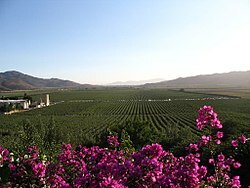 The Valle de Guadalupe (Guadalupe Valley) is an area of Ensenada Municipality, Baja California, Mexico that is an increasingly popular tourist destination for wine and Baja Med cuisine. It is located 20 kilometres (12 mi) north of the City of Ensenada and 113 kilometres (70 mi) southeast of the border crossing from San Diego to Tijuana. It includes communities such as Ejido El Porvenir, Francisco Zarco and San Antonio De las Minas, and had 2,664 inhabitants (2010 census). The community was founded in 1834 by Dominican missionary Félix Caballero as Misión de Nuestra Señora de Guadalupe del Norte, making it the last mission established in the Californias. Caballero had to abandon the mission in 1840, under attacks from the indigenous peoples. From 1905-1910, a mixture of Spiritual Christian faiths from South Russia, mostly Pryguny, settled in 4 farming colonies near Ensenada, Baja California Norte Territory, Mexico. Guadalupe was the main colony of about 20+ square miles purchased in 1905. Most owned or rented land communally. Not all were ethnic Russians, and were of various faiths, but mostly non-Orthodox. They also rented as much as 50 square miles from about 10 nearby ranches. A few other immigrants from Russia lived in Ensenada city. Most moved to California during World War II to join more prosperous relatives and work in the war industries. Most of who remained, intermarried and live in Ensenada and Tijuana. When the valley economy shifted to wine-making, the Baja government funded a museum, to preserve the history of the former settlers from Old Russia and enhance wine tourism. Soon two private museums opened, one with a cafe across the street from the state museum, to provide Russian-Mexican dishes for tourists and groups. Roads are improved with asphalt paving to accommodate wine-tour buses. Since the 1990s the association of winemakers of Baja California holds the Grape Harvest Fiestas in the Valley of Guadalupe and the town of Ensenada every year in August. The celebration includes wine tasting sessions, concerts and soirées, and samplings of regional cuisine and Mexican wines. Wine tasting is available year-round, and several of the wineries have built up-market restaurant/tasting establishments aimed specifically at tourists from the United States. A winery tour is usually included on cruise ships that stop at Ensenada. Diego Hernández heads up Corazón de Tierra, rated by William Reed Business Media (the "San Pellegrino survey") as one of Latin America's 50 best restaurants, while chef Javier Plascencia is present with his Finca de Altozano, and Drew Deckman with Deckman's en el Mogor. The area is a center of Baja Med cuisine. Hotels of note include chef Javier Plascencia's Finca la Divina, Bruma, a 200-acre eco-luxury resort including a working winery, 15 villas, and a 40-room hotel, and Encuentro Guadalupe (originally from Grupo Habita, now under other management), whose 20 eco-friendly rooms blend in with the landscape. ^ "This is the best wine country you've never heard of". The Independent. 2017-11-10. Retrieved 2018-01-23. ^ "Foodies can find a Mexican culinary oasis just south of the border". ^ ""Corazón de Tierra", "The World's 50 Best" website". ^ Gardiner, Michael A. (19 September 2016). "The Valle de Guadalupe Is Mexico's Wine Country That You Need to Be Visiting, Like, Yesterday". History of the Valley of Guadalupe and other wine-producing villages. Pryguny in Baja California, Mexico, by Andrei Conovaloff, Updated: 30 July 2016. This page was last edited on 12 February 2019, at 01:31 (UTC).